For the past few weeks it has rained almost every day which gave me all the incentive needed to finish a few works in progress. Yesterday I finished a needlepoint stocking that took almost a year to complete. Not that the project should have taken that long, but I had no pattern and was using wools leftover from other projects, so needless to say I had many false start before settling on a design and colorway. We had our first hard frost a week ago so the vegetable gardens were pulled, last of the pasta sauce made and canned, and the dehydrator loaded. Now that gardening duties are over I have some time to spend on crafts. Needlepoint project I have been working on for the past 5 years. Finished her dress in the last rotation. New long term cross stitch project. 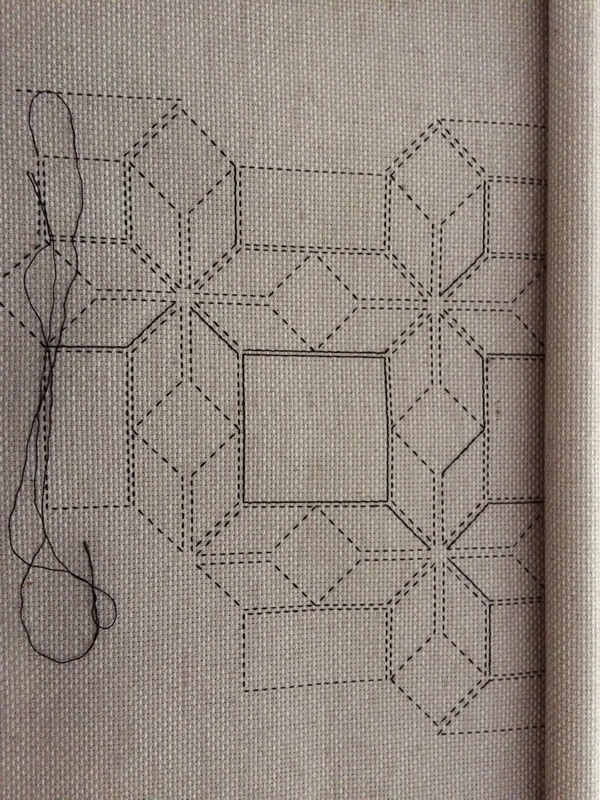 When it is done it will be 25″ X 31.5″ and contain 495,000 stitches… I do like challenges. A stack and whack project waiting patiently to be laid out and stitched. The visibility has helped, With the exception of the quilt for the new grandson I have been able to keep my resolution. A project I just finished this year was a painted needlepoint canvas. What makes this project a special accomplishment is that was in my stash for close to 10 years. I really enjoyed working this piece so I have no ideas why it took so long to finish. Now I just need to figure out what to do with canvas piece…. work has been so busy the past few months that ther has been little time for blog posts. Each evening when my mind just couldn’t concentrate on anymore work I would add a few more stitches to a needlepoint stocking I started last fall. Today I finished the top…next step is to add the braid, lining and backing. Maybe the next steps will be completed later this summer when it gets to hot to be outside. I am moving along at a snail’s pace on my craft projects. One of my biggest problems with crafts is that I like so many differs types and want to try them all. At this time there must be 20-30 started projects of different types. Every few years I try to get the UFOs under control, that is until I make a mistake in one of the projects. When an error is made that requires that something be re-cut or ripped out it has a tendency to be moved back to the UFO pile until I have more patience or it is need as a gift. This year I promised myself that no new projects would be started and no new threads or fabrics purchased. I have already broken the first promise to myself by starting three new projects this year, but have held fast on the “no new purchases” promise. So far this year five old projects have been completed and progress made on two additional UFOs. Last night I finished the flying geese ring for a star quilt that I have been working on for two years. The next piece to be cut is the solid ring that will be placed between the star cluster and the flying geese ring. Not sure when I will get back to this since I haven’t really felt like spring a lot of time with my sewing machine recently, spring will be calling me outside, and work will start getting very busy in the near future. 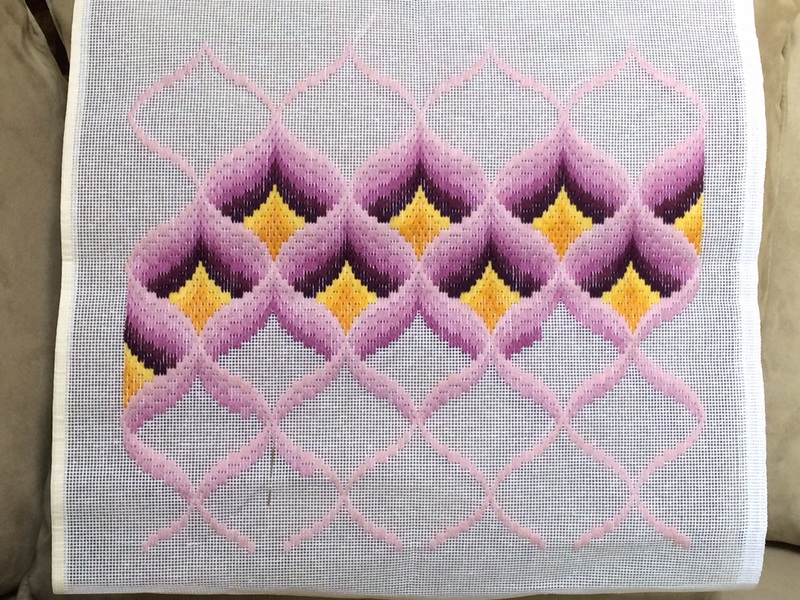 The other project that I have made some progress on is a needlepoint canvas that I started more than 10 years ago. Since it is rather small and easily be moved from room to room, it may actually get finished this spring. Today I finished the second holiday break project. The Shooting Star blackwork piece I finished about a month ago was made into a pillow with a red velvet three inch border on the front and black velvet backing. Initially red satin cording was added to the edges, but unfortunately, I am not weary good at working cording around corners. The pillow top had to be picked apart cording ripped out and put back together before I was satisfied with the final product. 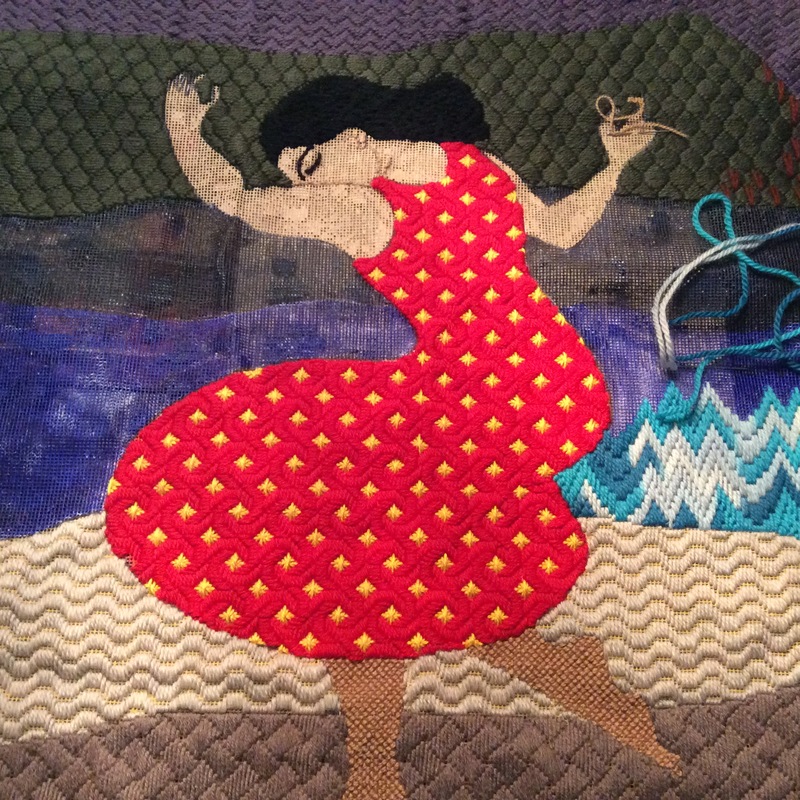 Over the past few weeks I have made a great deal of progress on the 27″ x 47″ lady at the beach (working title) needlepoint piece. 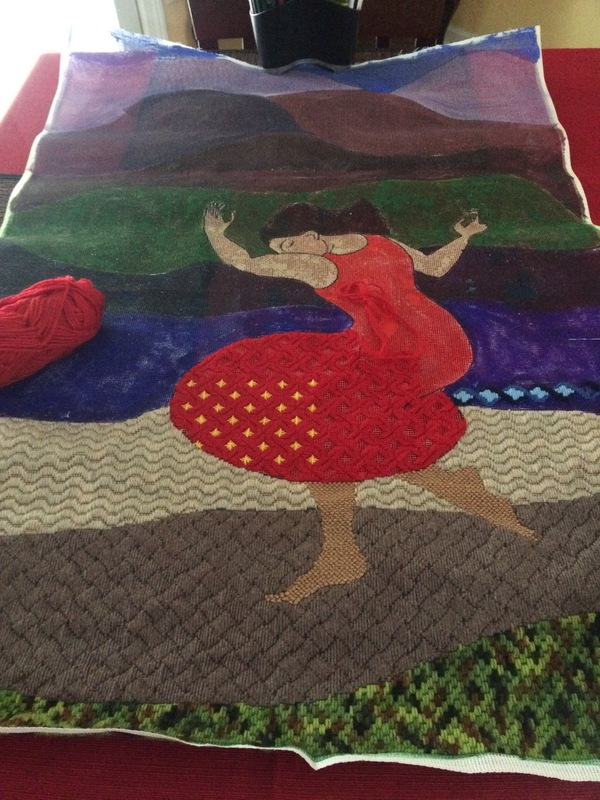 The lady’s dress was finished with wool and silk/wool blend yarns. The fields and walking path have been completed for the most part — still need to finish adding the tree details in the field, but will wait until the unit is on a stretcher frame to complete the area. Due to the size of the canvas I need to build a custom stretcher frame. The wood has been cut and is sitting on the workbench in the garage. Unfortunately, holiday and house projects require that frame building and additional stitch work be placed on hold for the next several weeks. 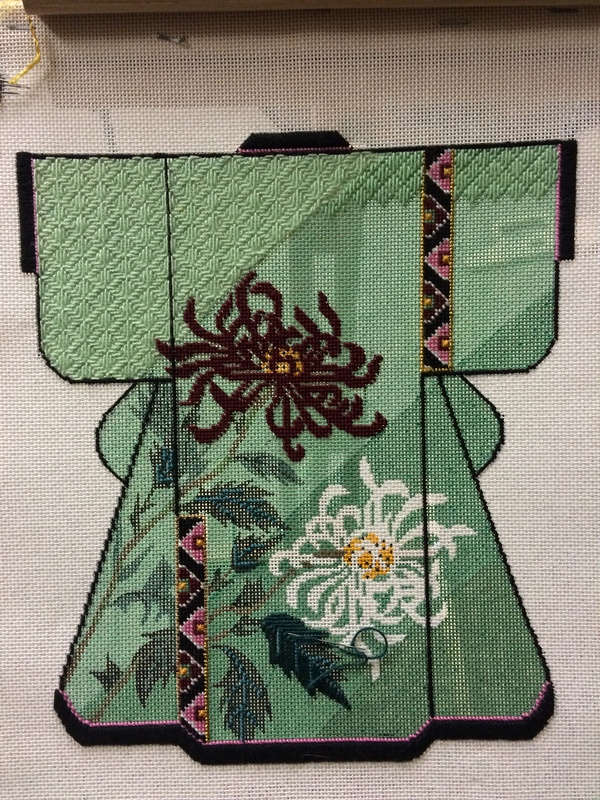 This month I finished one needlepoint project and start two more and a Blackwork piece. I have a tendency to loose interest and items have a tendency to risk falling into the UFO pile if I don’t switch back and forth between projects. A canvas I bought 5-6 years ago has made it onto my frame. I work on this unit when we are watching tv in the family room ( I really don’t pay much attention to tv so it is always nice to have something else to do). 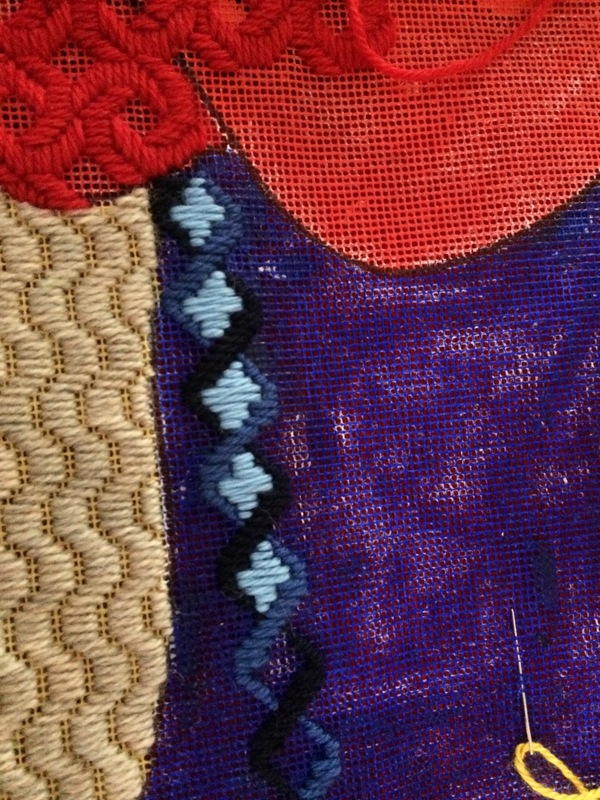 Progress is also being made on one of my own needlepoint designs. I really love working on this 14 point canvas. It allows me to use some yummy knitting yarns. This past week I also started a new Blackwork project. I really love the geometric pattern so have been spending a number of my evening hours working on the project. 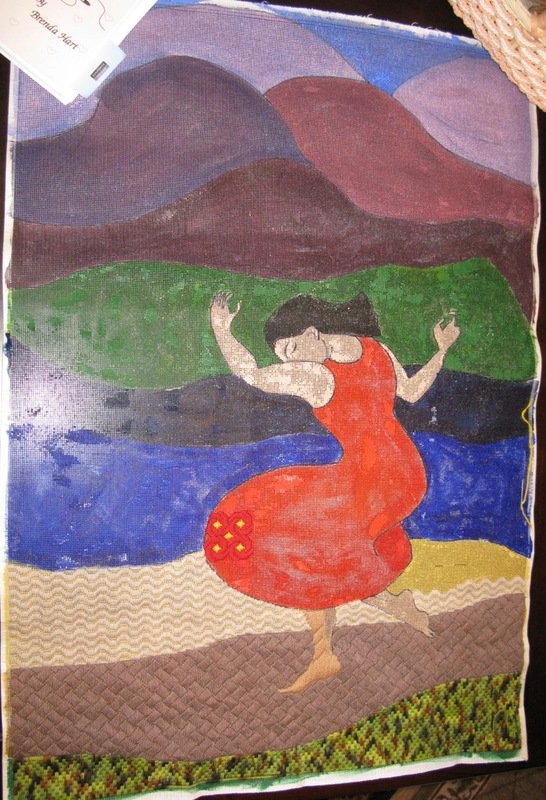 I started the second project in my dancing lady series a few weeks ago. The series will contain four 4 foot by 6 foot works when completed. Each work will have the same female figure as the central focus with a different background and medium. The first lady project was a quilt top finished in the spring that still waiting to be quilted. 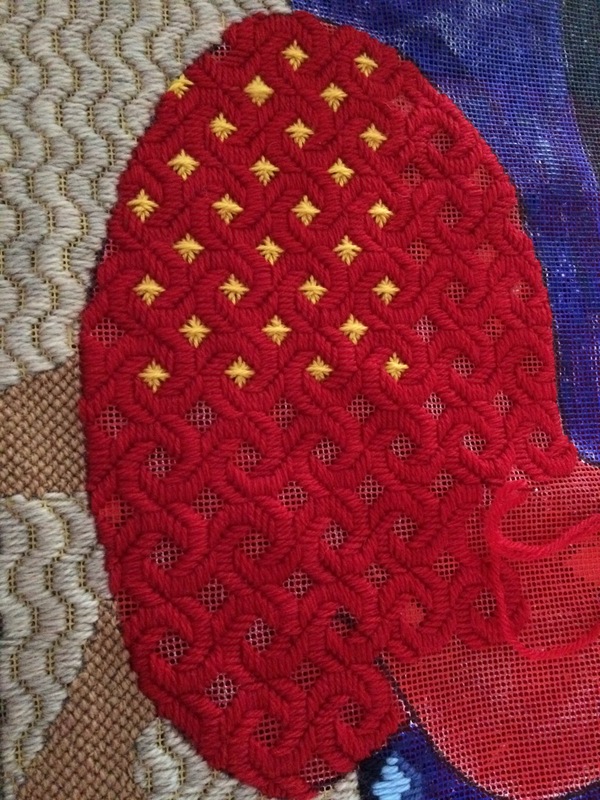 The second is a large needlepoint piece that allows me to explore a series of very interesting stitches and yarns. I found drawing the pattern on the canvas very easy, but made a number of mistakes when painting the canvas. I used the wrong type of brush to paint with so had some heavy spots on the unit, and allowed the painted canvas to dry on newspaper which caused the newsprint to adhere in places on the back of the canvas. Both mistakes could be worked around with a bit of effort but I distorted the canvas a bit when correcting the issues, hopefully I can correct the situation when blocking the unit. All in all I learned a number of valuable lessons and will do better with my next needlepoint design. So far the stitch that I am using for the dress is one of my favorites, but have selected a really interesting bargello pattern that uses three shades of blue for the water that may become a new favorite. What are some of your favorite stitches? 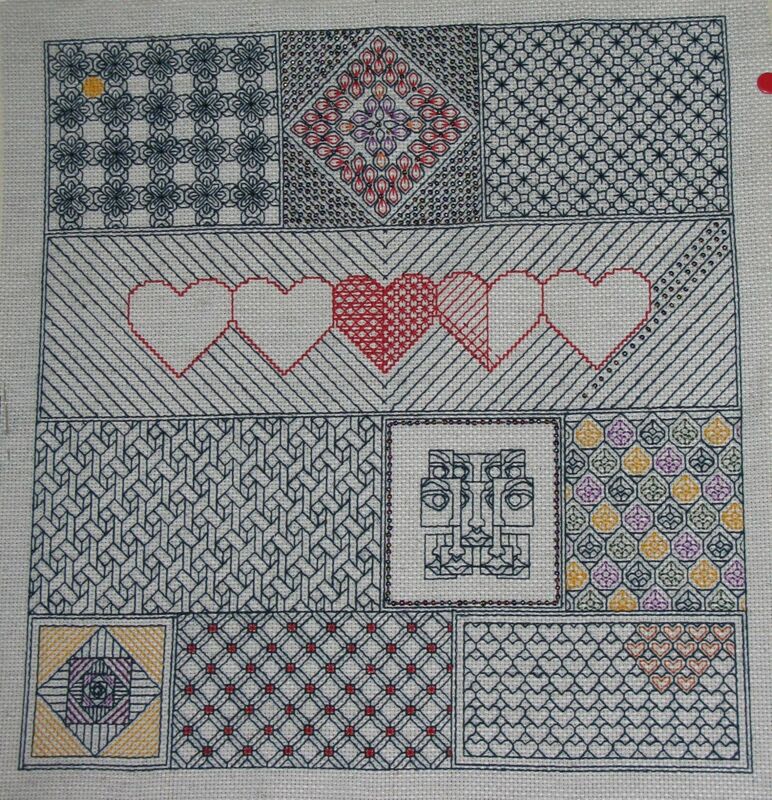 Over the past month I have made a fair amount of progress on my blackwork sampler. 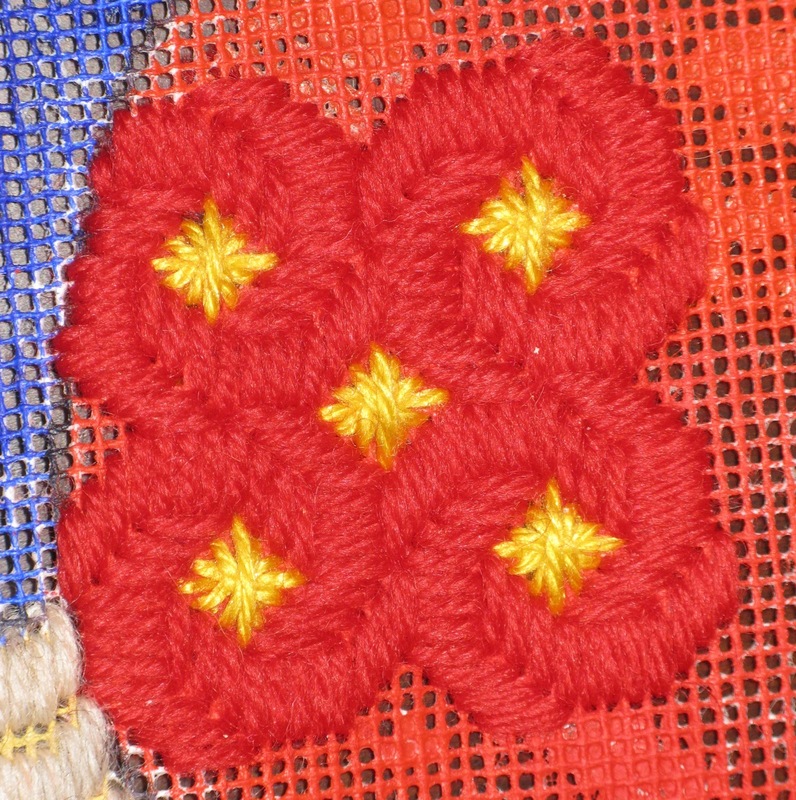 All of the quadrants have been either completed or the main thread of the patterns have been stitched. I still need to finish the orange on the bottom right corner, multi-colored flowers in the upper left-hand corner, the red hearts, and the beading around the hearts. The completed sampler will be used as the center of one of my quilt projects. If all goes according to plan this piece should be completed in early fall…. That is as long as I don’t lose interest in the project again. The past couple of weeks have been just wonderful. It has been sunny and warm almost every day and evening rains have taken care of the garden watering. For the past week we have been able to pick blueberries, sour cherries, raspberries, asparagus and kale daily, so needless to say we had wonderful salads and smoothies for our meals. Quite time on the patio has also allowed me to work on a few needlepoint pillow tops (normally have 2-3 going at a time), and the late nights even provided time to finish a few of the units. Over the next few weeks I will be finishing up 2-3 more pillow tops before I move onto a few quilt projects waiting in the wings, and dehydrating and canning of some of this seasons produce. Here in the North country we are about two months behind with our growing season this year. April was dry and cold and June brought us the April showers. All of the rain this month has refilled the rain barrels and encouraged the vegetable seeds and starters to thrive. Unfortunately, the wet weather has dramatically reduce gardening time which has allowed the weeds to thrive along with all of the plantings. Fortunately the rains have allowed me more time to work on a few fiber projects and do a bit of canning. Over the past few day I canned pineapple and carrot cake jams and dehydrated a few early season herbs. 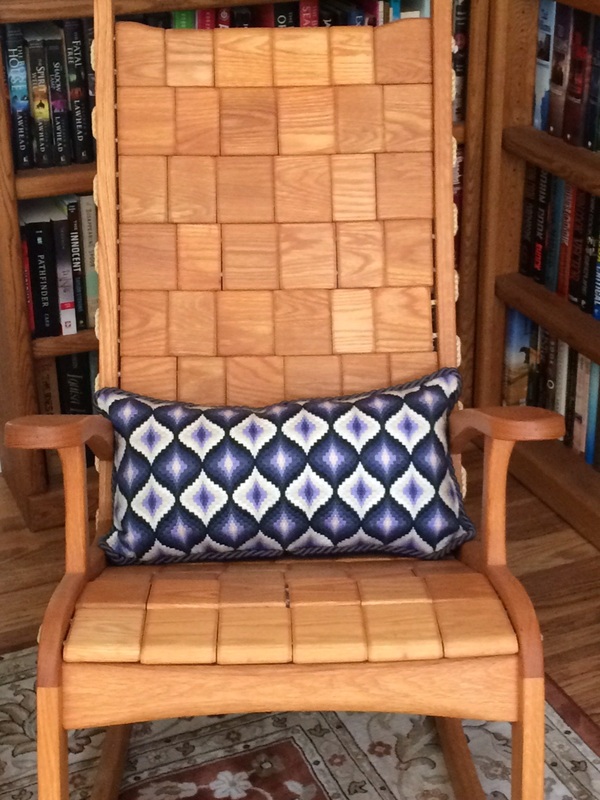 This morning I finished another bargello pillow top. 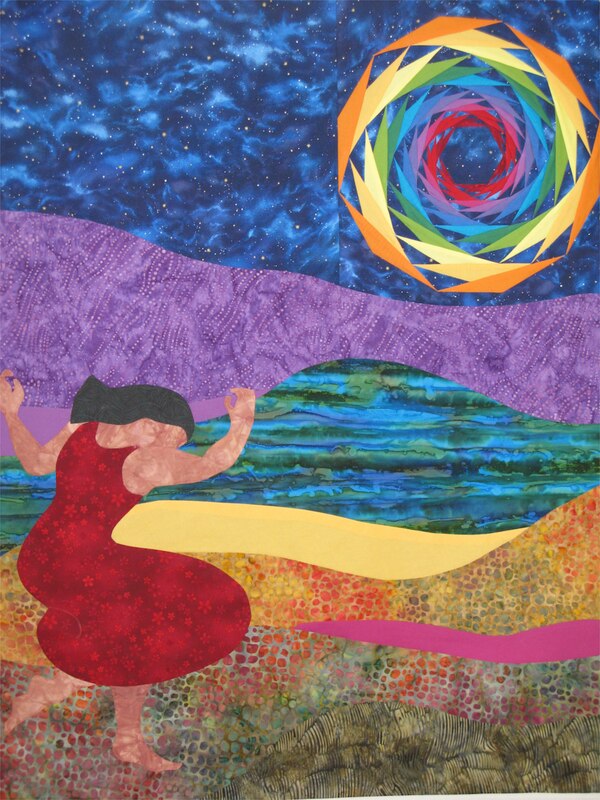 Now that the warm weather has finally arrived most of my quilting projects have been placed on hold and needlepoint is worked on at night and during road trips. 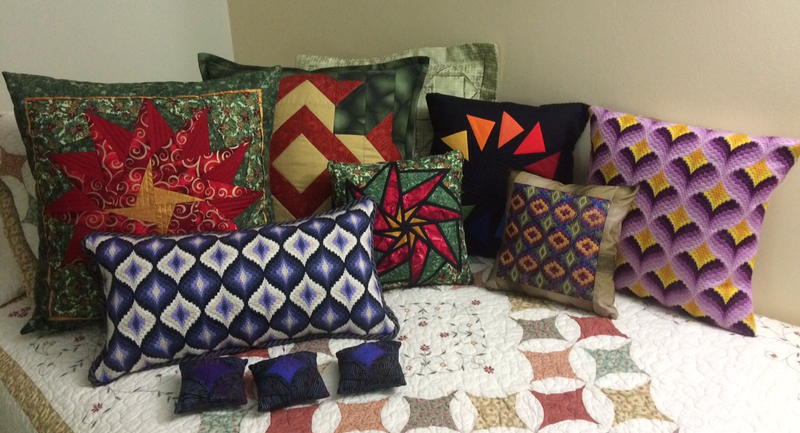 This summer I plan on completing 6-8 pillows using various Bargello patterns using wool and silk fibers. This afternoon I finished the first pillow. 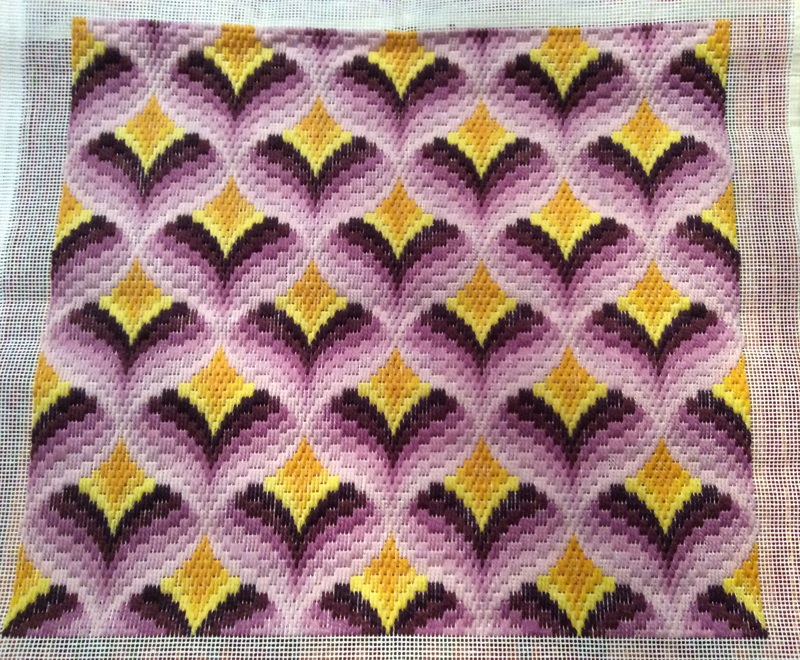 I have also started the second pillow top that is being stitched in six shades of purple and three of yellow. Since my honey is away at a conference for the next week I should be able to finish the second top and move on to a more complex piece soon. Enjoy the wonderful summer weather. May was a very busy and productive month. Vegetable gardens were planted, flower beds tended, a few craft projects moved forward and the first kayaking of the season was enjoyed. This year we are growing: tomatoes, red and yellow peppers, various hot peppers, number of different herbs, two types of eggplant, collard greens, purple kohlrabi, cucumbers, pie pumpkins, three different types of kale, corn, delicata squash, zucchini, 3 types of beets, carrots, potatoes, radishes, onions, asparagus, and couple of different dried bean types. Our fruit trees and bushes are doing well and will provide us with: apples, 3 types of pears, plums, blueberries, grapes, and hazelnuts. The following are pictures of some of the developing produce. The heavy snows this winter really protected and provide a nice environment for the perennials to split. Although the plants were about four weeks late in breaking the ground, they rewarded us with the promise of a lovely display. The following pictures show some of the flowers we are being rewarded with this year. It was wonderful to work in the gardens after the harsh winter and late start to the warm season. I look forward to the daily maintenance activities. The April showers didn’t show up until May so I also had some time to work on a few unfinished craft objects. A needlepoint pillow top was completed, significant progress was made on a blackwork piece (will be given as a Christmas gift), and an English paper piecing project. In June I hope to get to a few house projects and hopefully work on a few more UFOs.